We’re delivering more access to GO, across our region. GO Expansion is more than just adding more trains (from 1,500 to 4,000 weekly trips by 2025), it will transform the region with frequent, two-way all-day rail service, more than doubling the number of GO Transit riders by 2031. Sixty-six GO Rail stations currently serve our customers daily. It’s also about a more connected network. To help make those connections a reality, we’re delivering new stations across our region. Adding more stations will mean 350,000 more people will live and work within walking distance of frequent rapid transit, with better options to travel locally and connect with the entire region. Six of our new stations are part of the City of Toronto’s SmartTrack program, designed to introduce new urban stations in the City of Toronto, with frequent GO Train service on the Kitchener, Lakeshore East and Stouffville lines. Some of our existing stations will be undergoing improvements and renovations as well. The scope of work for these stations have been separated into two categories: early station improvements, targeting 31 stations and existing station renovations which will impact 22 stations. The work at these stations could include improvements to parking, bus loops, pick-up and drop-off areas, bike storage, platforms, stairs, elevators and more. In addition we’re working on new stations on Lakeshore East’s Bowmanville Extension, Lakeshore West’s Niagara Extension and the Eglinton Crosstown LRT, at Caledonia and Mount Dennis. You’ll be connected to rapid transit more than ever. On June 28, 2016, the Metrolinx Board approved 12 new stations across the GO Transit Network within the GTHA. Six of those stations are new SmartTrack stations on the Stouffville/Lakeshore East and Kitchener lines. The remaining six are new GO stations, and include five on the Barrie lines and one on the Kitchener lines. A map of the 12 new stations is shown below. In March 2018, Metrolinx issued the Preliminary Design Business Cases (PDBCs) for the 12 new stations. The PDBCs take the initial business case results and refine them with more detailed costing and analysis of benefits. The PDBC analysis captures evolved design concepts, revised modelling methodology, changes in municipal and provincial plans, and updated operating patterns and service plans since 2016. The PDBCs can be viewed here. Like all major infrastructure projects, new stations analysis has relied on a progression of decisions to guide their advancement. Stage 1 - Identified an initial list 120+ sites using key site and network considerations. Stage 2 - Focusing analysis: Analyzed site factors, service considerations and historical requests, to scope list to 50+ sites. Stage 3 - Evaluating: Analyzed strategic, economic, technical/operational and cost/revenue considerations of 50+ sites. Stage 4 - Municipal and Public Engagement: Consultation, feedback and review of 50+ sites. Stage 5 - Refining the list: Following public engagement, scoped sites for further analysis. Stage 6 - Business case analysis (we are here). We initially looked across the network and identified 120+ potential station locations, taking into consideration municipal interest, current station spacing, transportation connectivity, ridership potential and space availability for a station. In order to focus the list of 120+ sites to 50+, a review based on strategic and technical feasibility criteria was done and a score was given to each potential location. All sites on the 120+ list that were identified as candidates in public documents (e.g. municipal plans, SmartTrack) or previous projects, but not related to GO Expansion, were included in the 50+ list of stations. The 50+ locations were then analysed looking at strategic, economic, technical/operational and cost/revenue considerations and narrowed down to 17 potential station locations (or clusters of comparative station sites) that were examined in more detail using an initial business case (IBC) analysis. The Business Case is a ‘living document’ used throughout the entire decision-making lifecycle of a major project. This lifecycle – the transition from options analysis to planning and design of a preferred option and finally to delivery and operations – relies on a progression of decisions to guide an investment’s advancement. The Metrolinx business case is just one of several factors that is used in making a final decision. It is important to recognize that there are a wider range of factors that are considered as part of final decision-making process. Over the course of an investment's lifecycle, four Business Case documents will be prepared to provide the level of evidence that is appropriate at each stage. The Initial Business Case reviews variations of the preferred investment(s) from the Strategic Business Case as part of detailed planning. This Business Case selects a preferred option for further refinement and design. Part of Options Analysis. Occurs prior to significant design. What does the Business Case lead to? Selection of a preferred option for further design and analysis. The Preliminary Design Business Case selects a specific option and reviews different approaches to refine or optimize it. This Business Case leads to a single preferred option for final development. Part of Preliminary Design. Occurs prior to construction approval. Detailed design and development of the preferred option. The Full Business Case defines a specific option (including benefits realization, financing, and delivery plans) for procurement. Part of Design and Procurement Preparation. Occurs prior to Procurement (RFP release). Definition of a preferred option to allow for procurement. The Post In-Service Business Case reviews the actual costs and performance of the investment. Post delivery after the investment is operational. This review supports ongoing investment optimization and also supports future Business Case Analysis for other investments. See our Business Case page for more information. For each of the 17 potential stations, an initial business case analysis was performed (looking at the Strategic, Economic, Financial, Operations and Deliverability cases for each location) with consideration for policy, infrastructure, and operational advancements. For more details, see the RER New Stations Initial Business Cases Summary and Ranking Report and individual site-specific IBCs for details regarding methodology and findings. 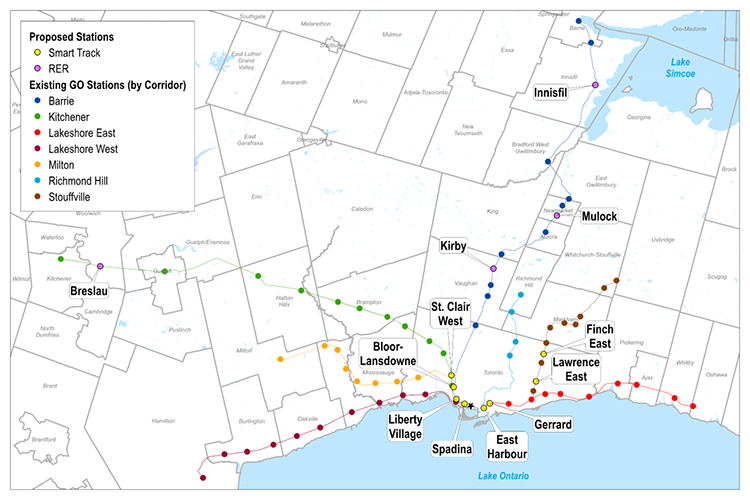 The results of the IBC analysis provided the basis for the Metrolinx Board Resolution on June 28, 2016, announcing 12 stations to proceed as part of the GO Expansion program. Metrolinx and municipal staff have since been working closely to move the station planning forward for these 12 sites. In the Metrolinx Business Case lifecycle, the Preliminary Design Business Case (PDBC) takes the IBC results and refines them with more detailed costing and analysis of benefits. The new stations PDBC analysis will capture evolved design concepts, revised modelling methodology, changes in municipal and provincial plans, and updated operating patterns and service plans, since 2016. PDBCs have been done for all of the 12 announced station sites. In addition, the 5 station sites that were deferred by the Metrolinx Board have had their IBCs updated. The analyses for all 17 sites can be viewed here. Recommendations related to each of the 17 stations were brought to the Metrolinx Board of Directors on March 8, 2018 and are available here. A New Stations Modelling Backgrounder technical report, published on Friday April 13, 2018, is available here. * Following the Board’s June 2016 direction, two additional IBCs were initiated for the Highway 27-Woodbine site and the Walkers Line site.